People who travel to restaurants by private transportation other than their feet have often had a little problem. They must do something with their horse, carriage, or car. 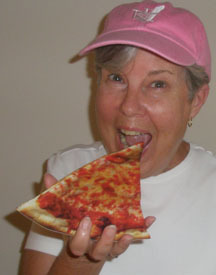 As basic as this situation is, it has bedeviled eating places through the ages. 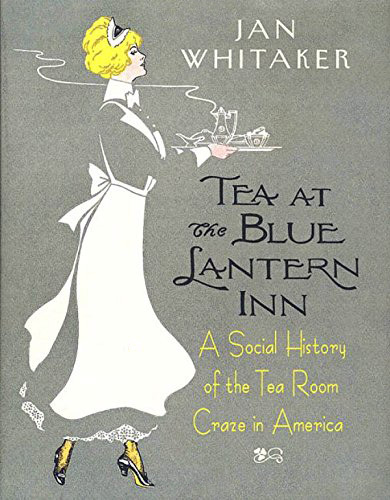 Into the mid-19th century, eating places which were also overnight accommodations were legally required to take care of their patrons’ means of transport, i.e., horses. In Haverhill MA, innholders, taverners, and common victualers had to follow rules that included hanging a sign, accepting all travelers, and providing feed for horses. As urban downtowns grew after the Civil War, fed by trolleys powered by horses, steam, and electricity, restaurants developed independently of hotels and boarding houses with no need of facilities for horses. It must have been a relief, especially as land values rose. 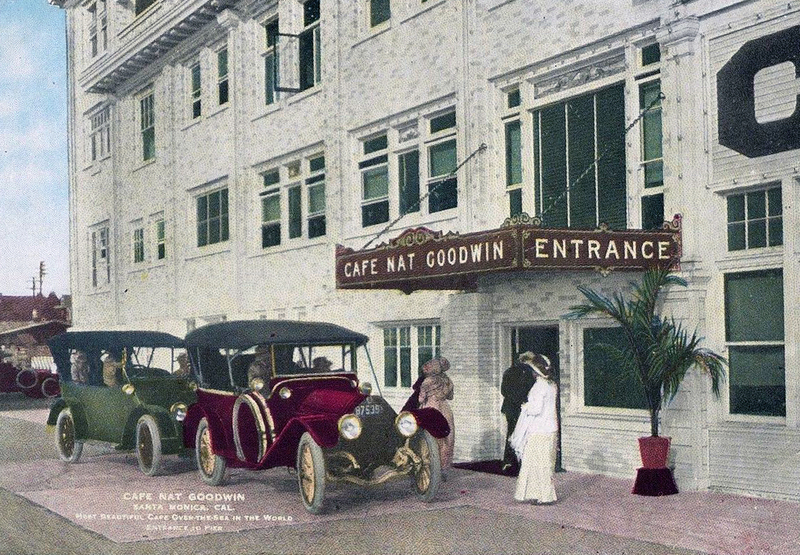 At first the arrival of cars in the early 20th century might have seemed like a blessing, delivering patrons directly to the front doors of restaurants. But it soon turned into a curse as unprepared cities became gridlocked with traffic that included a mix of autos, streetcars on tracks, and horse-drawn wagons. 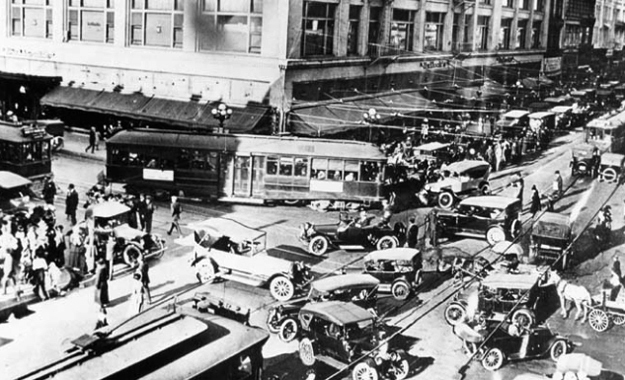 Denver, for instance, scrambled to solve downtown congestion after the number of cars on its streets doubled from 1912 to 1915. A common solution — ordinances that prohibited curb parking on busy streets — caused restaurant owners to rise up in protest. Kansas City restaurateurs objected to a ban on parking before 6:30 p.m., saying it would harm their early dinner business. In Portland OR and Omaha NE restaurant owners complained they would lose their breakfast trade if morning parking was severely curtailed as proposed in those cities. The owner of an Omaha chain pointed out that downtown restaurants paid high rents and would desert the city center for less expensive areas if strict parking bans were enacted. 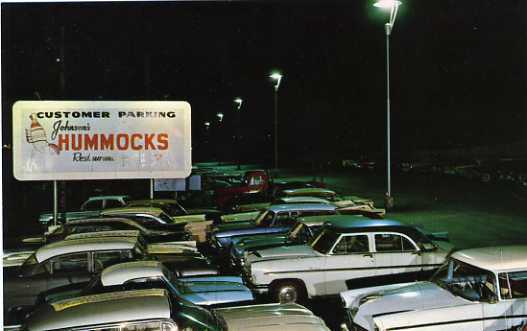 Meanwhile, restaurants lucky enough to have parking lots advertised the fact loud and clear. Restaurants and tea rooms (such as The Flume teahouse, shown here) in outlying areas with plenty of space for parking thrived. 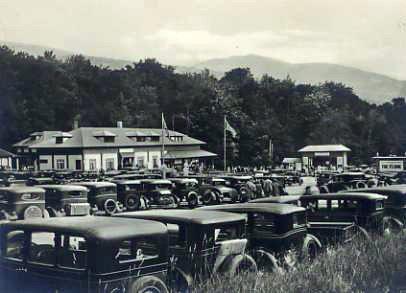 Warren’s Dining Car, located outside Worcester MA near the White City amusement park, advertised in 1927 that it had parking for 500 cars. With all the problems of downtown, it wasn’t long before restaurants began making good on their threats to relocate farther out, often in newer shopping areas on wider streets near residential areas. Anticipating the fast food chains of the 1960s, drive-ins chose to build on spacious lots surrounded by parking space. When Neff’s Drive-In opened in Corpus Christi TX in 1940 it boasted hickory-smoked barbecue served by “15 Beautiful Girls” on a full acre of parking space. 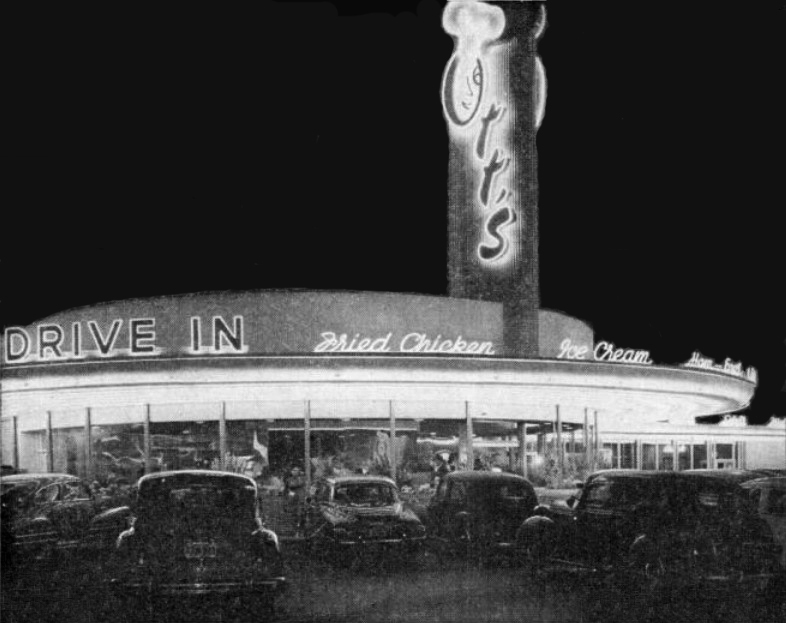 Ott’s Drive-In in San Francisco employed four traffic police to direct parking in its 250-car lot. But it took a high volume of business to warrant such a large parking lot. The director of a restaurant design firm in Los Angeles observed in 1961 how difficult it was to find an affordable parcel of land big enough to accommodate a restaurant and parking for customers. Economically it was unfeasible for any place not open 24 hours, he said. 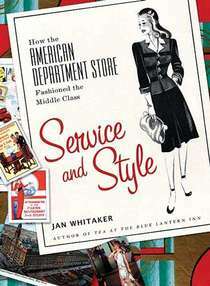 With 60 million cars on American roads in 1955, valet parking – which originated in venues with distant parking lots such as racetracks and sports stadiums – became common in urban restaurants with an affluent clientele who might otherwise avoid downtown. It brought its own set of problems, though, such as complaints about police taking payoffs in return for allowing attendants to park cars illegally. One creative solution to the problem of a distant parking lot was demonstrated by the Sir-Loin House, a popular Houston TX steakhouse. 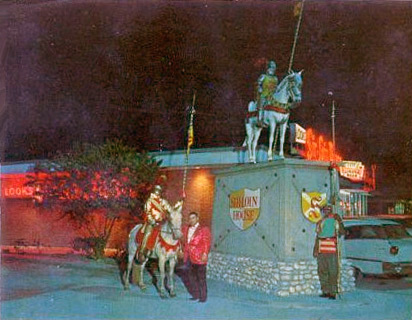 Adopting a medieval knighthood theme, parking lot attendants dressed as Robin Hoods and guests were escorted to the restaurant by a knight on a white horse. Although there are numerous parking garages in most urban areas today, parking still remains an issue for many restaurants and their patrons. The situation has almost certainly assisted the growth of fast food establishments with rapid turnover as well as the rise of premier restaurants in suburbs.